The day after our wedding, we took off on a 2 week long honeymoon that Curtis (my HUSBAND!!!) had planned for us. We started by driving 6 hours to St. Paul, MN. We made our first stop along the way in Decorah, IA, searching for letterboxes. We didn’t find any that first day, but that most definitely did not set the tone for the rest of our trip! While in Decorah, we also saw our first waterfall of the trip: Dunning Springs. We couldn’t have asked for better weather for our wedding weekend…and for our whole honeymoon in general! You never know what to expect for a Midwestern summer — will it be hot and humid? Cold and rainy? Severe thunderstorms or tornadoes? We totally lucked out with highs in the 70’s, the perfect cloud cover for pictures in shadeless areas, and pleasant temperatures throughout our whole trip for short hikes and visiting attractions. We made one more stop in Rochester, MN to find some letterbox series, but couldn’t figure out the clues and decided to push on to our hotel before dark. We spent our first night in St. Paul, MN in a hotel right on the Mississippi River. We arrived just after dark, but in the morning we walked outside, across a bridge and dipped our feet in the Mississippi River. We then found our way up to the top floor of our hotel (the Marriott) and enjoyed the views of the St. Paul and the Mississippi River from above. We then continued our drive North, where Curtis had reserved 2 nights in a lovely bed and breakfast in this lighthouse in Two Harbors, MN. It’s right on the edge of Lake Superior, and this cute little area is surprisingly full of attractions, short hikes, and letterboxes! After checking into the Bed and Breakfast, (where we were actually staying in the Skiff House right next door!) we started driving around town to look for letterboxes and see the sights. We found this view of our lighthouse from across the inlets while searching for a letterbox. That evening after dinner, we walked out on the rocks and pier right next to the Bed and Breakfast to enjoy gorgeous sunset views over Lake Superior. We saw many waterfalls on our trip! Here’s the second waterfall we saw at Gooseberry Falls near Two Harbors, MN. We found this one to be very busy, but still beautiful and worth a visit. Afterwards, we followed some letterbox clues to a much more secluded yet smaller waterfall that we had all to ourselves. Next, we went to visit the Split Rock Lighthouse. There were several letterboxes in this area — our favorite took us to this beautiful view of the lighthouse from afar. I love how it sits high on the cliff above Lake Superior! After finding the letterboxes for the lighthouse, we went to visit it and toured the inside. Besides the pretty views of the lake and the coast, we enjoyed the small lighthouse museum with the Lego display! 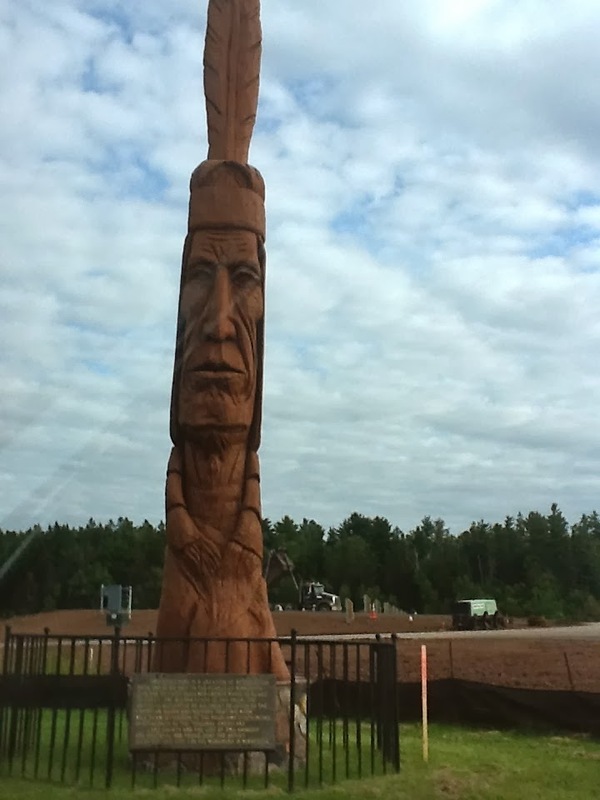 While driving back and forth through Two Harbors, we happened to notice this statue along the road. This is a Whispering Giant statue, carved by Peter Wolf Toth. He carved one for every state, and Curtis had recently learned about them. There’s letterboxes planted at or near many statues, so we found the clue and went for a walk in the woods to find the one for this statue. It was a random find, but we’re glad we spotted it and knew what it meant! Maybe we’ll come across more in our future travels. After 2 nights in Two Harbors, it was time to continue heading North into Ontario. 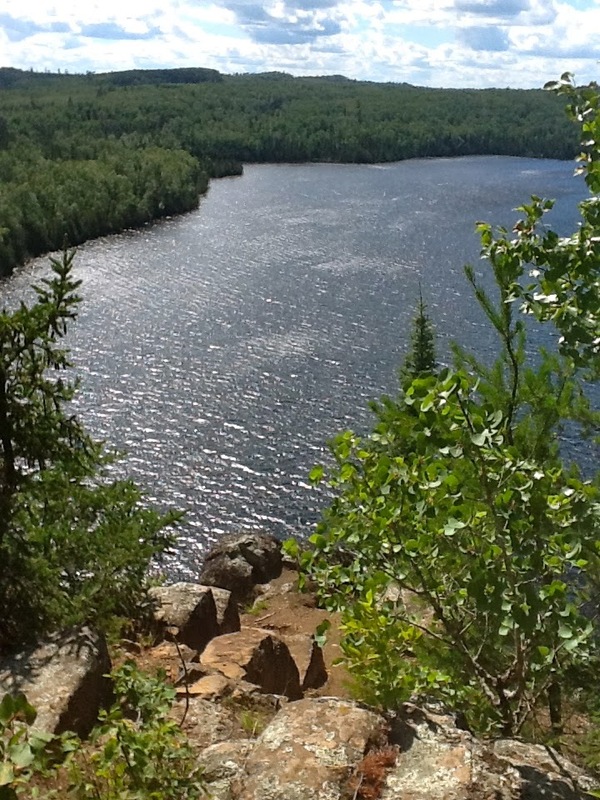 On the way, we took a detour and drove a ways up the Gunflint Trail. Along the way, we found what has turned out to be our favorite letterboxing location we’ve found so far. It was even called Honeymoon Bluff! It was just a short hike to an incredible overlook over the lake. It was a great example of a beautiful place we wouldn’t have found otherwise if we weren’t letterboxing! After this, we found 2 other letterboxes and then crossed the border into Ontario, Canada, where we spent 2 nights in Thunder Bay. We were so excited — it was our first time in Canada! After our time in Thunder Bay, we made our way across the North shore of Lake Superior. This was by far our favorite drive of the trip. There was hardly any traffic or road construction and everything went smoothly. There are also several quality drive by letterboxes with fun stories to them! The only disappointing part was that we never saw a moose. All the “moose crossing” signs made us hopeful we might see something! 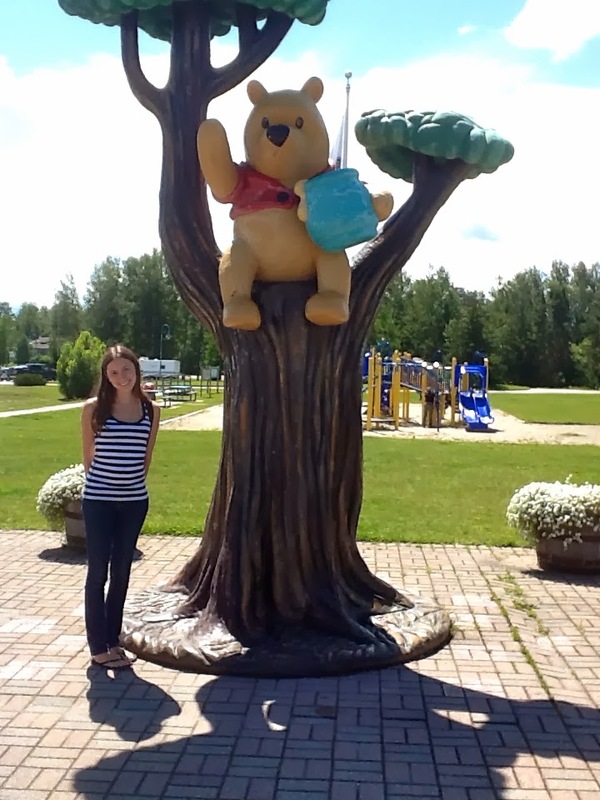 Our first stop: White River, ON – Birthplace of Winnie the Pooh! No really, the bear that inspired the series was born here. 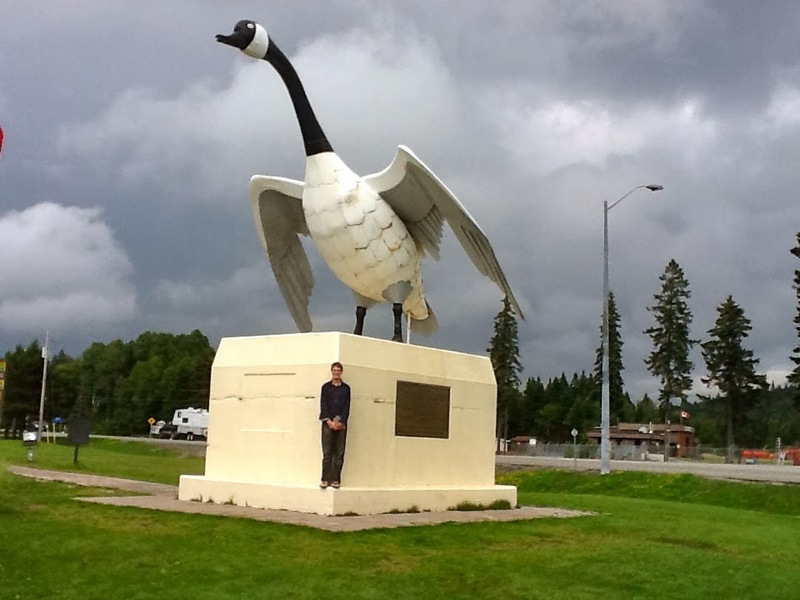 Next up, the Wawa Goose in Wawa, ON. An easy rest stop find, but a great carve. Lastly, Chippewa Falls – North of Sault St. Marie. We took a short walk to see these falls — more like rapids — but enjoyed it nonetheless. The only letterboxes along this drive were easy to find drive bys, but we appreciated the thought that went into the carves and locations. Altogether this drive was 6 hours long, and we enjoyed every part of it! We spent the night in a hotel in Sault St. Marie. The next day, we crossed the border into Michigan’s Upper Peninsula, then drove across to the lower peninsula to Indian River where we spent 4 nights in a family vacation cottage. We took several day trips, including Mackinaw Island and along the shore of Lake Michigan. We found all the attractions or short hikes through — you guessed it — letterboxing! We spent a day taking the ferry up to Mackinaw Island. We quickly learned that letterboxing was truly the best way to enjoy this island. It’s really a big tourist trap, and the best way to enjoy the beauty of the island in peace is to walk around the trails, guided by the letterbox clues. Also, it’s free. 😉 We did indulge in a little bit of that famous Mackinaw Island Fudge though, as recommended to us by literally everyone! We stayed at the cottage for 4 nights/5 days before continuing our road trip. We drove across the bridge in Port Huron, MI back into Ontario. We stayed in London, ON for a few days and caught the tail end of the Shakespeare festival in Stratford. We saw our second Shakespeare play together: Othello! (We saw our first, “As You Like It,” in summer of 2012 in Iowa City, IA) While in Ontario, we also drove around the countryside and hiked in the woods for letterboxes. We tried to go to Toronto but couldn’t handle the stop and go traffic, even from an hour out of the city! Perhaps next time we’ll look into public transportation, but then again, we are learning that we don’t enjoy big cities so there may not be a next time. On Saturday, August 10 (2 weeks after our wedding day), we left London, ON and drove to Niagara Falls. We considered stopping while there, but the area was quite busy and we couldn’t find easily accessible or free parking. Instead, we admired the falls while waiting in line on the Rainbow Bridge, entering into the United States for the final border crossing of this trip. We entered New York for the first time and drove North a little ways to find a letterbox at Devil’s Hole State Park. It was a short hike with nice views and a great (though creepy) carve! 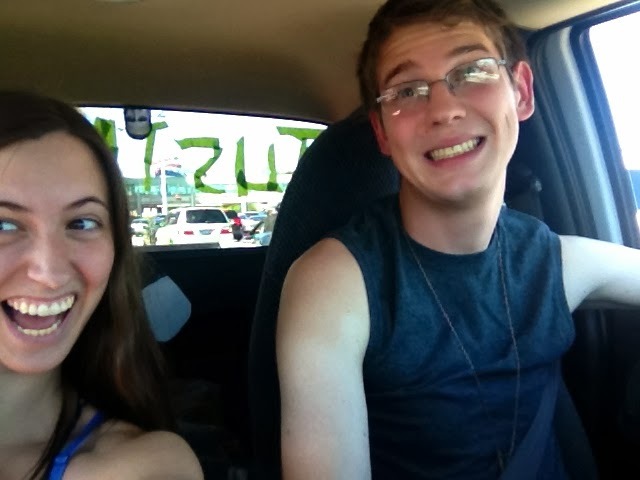 Us in our very decorated car — complete with “Just Married” and many cut out pictures of Nicolas Cage. Thanks siblings. At least the “Just Married” scored us some champagne! *Attention fellow Letterboxers* We have a traveler, Happy Honeymooners, that asks a question about our honeymoon. This post should help you figure it out. Be sure to try to answer the question if you ever meet us on the trails or at an event!